This is a post about clearing the air of any C&D worries. I wanted to break down just how legally safe this all is once and for all since the majority of comments I see for this game revolve around conversations of "this will be taken down because X looks like Y". Hopefully some explanation combined with the game's recent graphical update on Steam Greenlight will put those Cease & Desist concerns to rest. After being critiqued, first instinct is to defend your work, right? But then if you let that feeling pass and start thinking, you'll see things from an outsider's perspective and likely understand where they're coming from. Doesn’t really matter that I think it looks fine if nearly 36% of the people who’ve seen the game on Steam think it’s hot bootleg garbage. 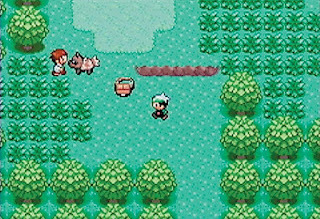 Overlooking the game because it has ponies in it is one thing, but if a certain art style was making people think that this game is like every other bad Poké-clone they’ve ever seen, then I need to change it. So I did. All the human characters were remade to be taller, have bright visible eyes on large heads, and overlap the tiles behind them. The grass was redrawn to look more squashed/stomped on, and folding along with the overhead perspective to look like they're growing out of a focal point in the ground. 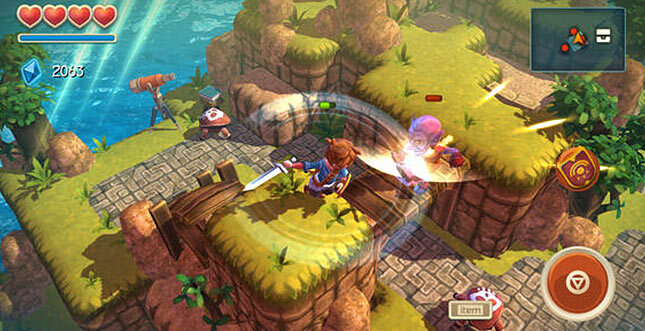 The game's buildings were also altered to better fit these larger human sprites. 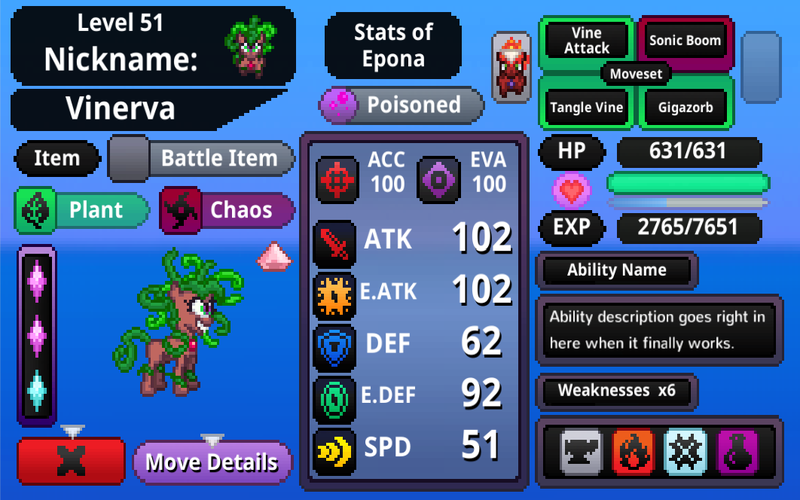 With regards to the other property I was dangerously close to, Vinerva was changed to no longer look like My Little Pony's The Mane-iac. Vinerva was confusingly similar, so I pushed further into the medusa aspect of her design and ended up with this tropical/stone-colored cyclops with a snake tongue. The main focus was changing those red/green eyes framed by (and contrasting with) a purple body. That face was indistinguishable from The Mane-iac, and thus, unsafe. In my head I'm thinking about it in terms of what you'd think it was in a vendor hall setting. If you're at a convention and somebody makes a plush/keychain/body pillow/etc. out of Vinerva, would you be able to tell it was her? Or would most people assume it's The Mane-iac with a weird haircut? A similar philosophy is guiding me for Poni-Bot's redesign. 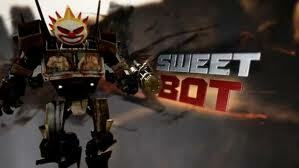 The character was originally known as "Sweet-Bot" under the assumption that the Sweetie-Bot character was a public domain joke with no official visual appearance. But in the eyes of the brony fandom, there is a collective visual identity of a small white robot with curly pink/purple hair (metallic or otherwise). Anything looking like that is assumed to be a Sweetie-Bot interpretation and thus be the artist's version of that exact character. 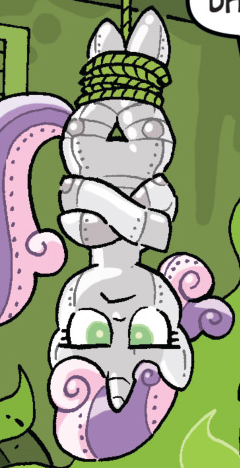 The closest to a canon interpretation to Sweetie-Bot I could find. From the official My Little Pony comic as a throwaway gag. 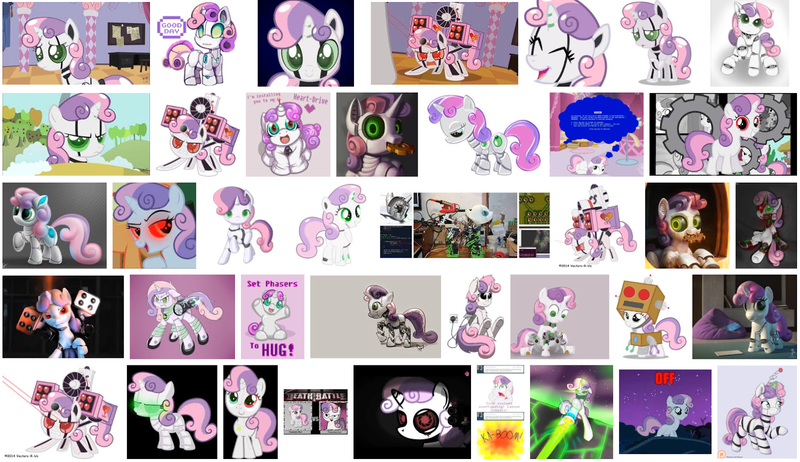 exists as a robotic voiceover for Sweetie Belle. 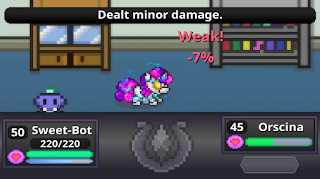 Although I wanted to pay tribute to that character since the day I came up with Battle Gem Ponies, I never wanted the one in my game to be considered the actual Sweetie-Bot. So after numerous color experiments I decided on a look that matched the clean/white Apple product paintjob, contrasting hair that draws the eye across the pony's body, and a glowing face with LEDs on the eyes and horn. And the FNAF inspired leg and body segments around joints were there from the start. and not confuse people into assuming it's a 100% electric pony. character/machine has already been taken by this guy. So now if you were to see merchandise of of both the Sweetie-Bot and the Poni-Bot characters, you could easily tell them apart. The Battle Gem Pony has a green gemstone and blue hair. Prominent features interpretations of Sweetie-Bot will not have. 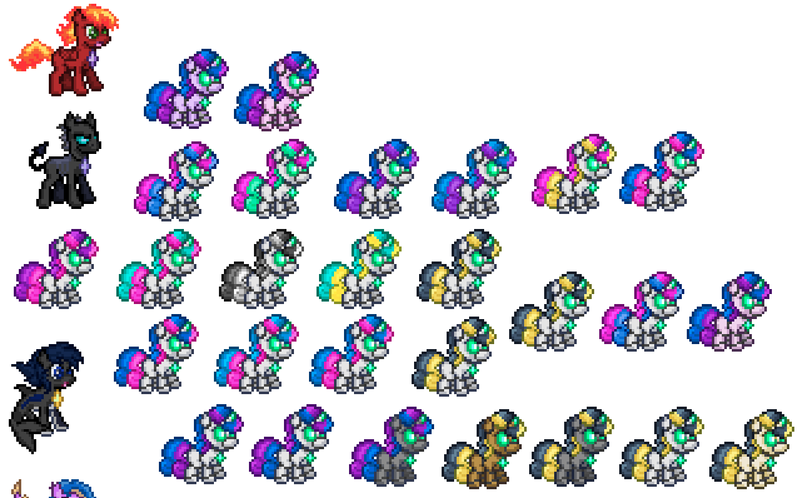 In addition to these ponies there's the likes of Furum, Joyance, Shyshock, Rainbryte, and more who are still undergoing sprite revisions before being animated and added to the game. 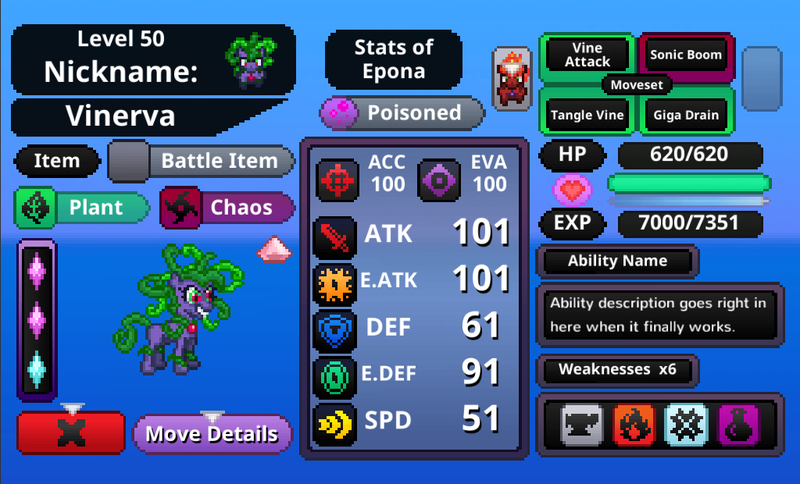 The 'confusingly similar test' will help me refine their sprites and make it so the characters look more like Battle Gem Ponies and less like bad OCs (a comment I often see when sharing promotional images featuring them). Rainbryte definitely needs new wings to not look like a Rainbow Dash OC. 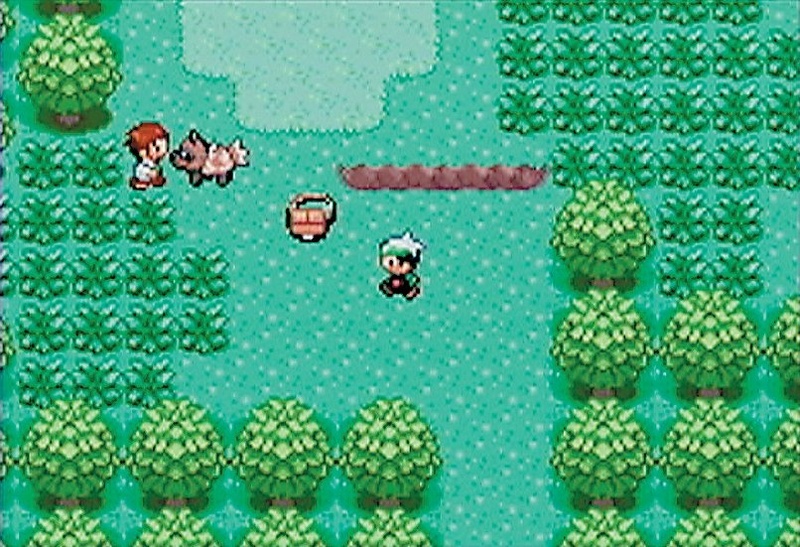 Another change to the game were the names of moves like Fire Blast and Giga Drain to distance this game from Pokemon. If a move could be renamed to something else that describes the attack just as well, it was changed. 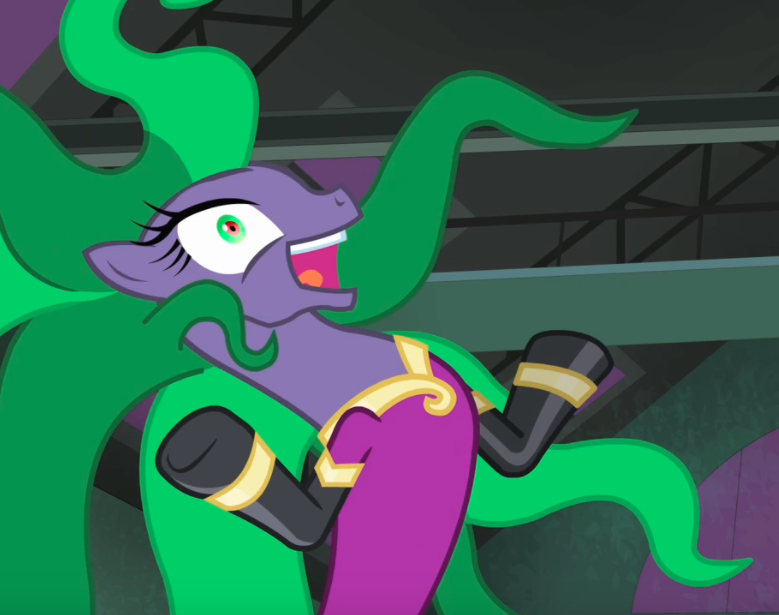 The only reason for one to share a name with a Pokemon equivalent would be if it were something basic like "Twister", the name of an attack where a pony summons a small tornado. The 360 move names will be the easiest alterations to make and may continue to change throughout development. Now let's get into gameplay copyright. 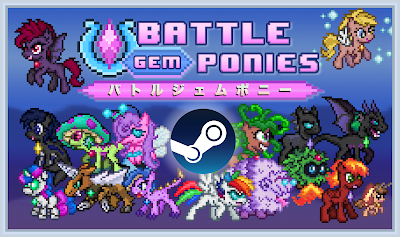 Beyond having characters that resemble other characters, Battle Gem Ponies has gameplay that's nearly identical to one of the most (if not THE most) popular RPG series in the world! Surely Nintendo would crush anything even resembling Pokémon, right? 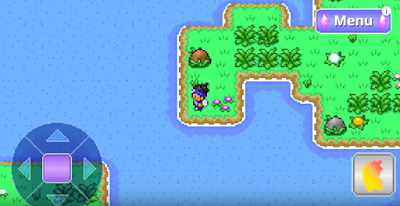 Just like they did with Uranium, Pokemon Prism, and the Metroid 2 Remake! Except Uranium took itself down, and Pokémon Prism is one of the working titles of their next game. I'm able to name Pokémon clones both released and in development with much more press attention than me. 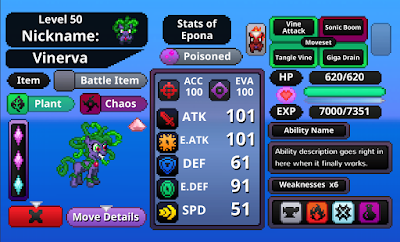 EvoCreo, Micromon, Exomon, Collectems, Zenforms, Little Masters, Haypi Monsters, Monster Squad, Monster Park, Monster Galaxy, GeoSociety, NeoMonsters, Battle Camp, Moonrise, Mightymon, Mino Monsters, Tap Tap Monsters, Dragon City, Pocket Mortys, Hunter Island, Yo-kai Watch, and countless others have all implemented their own spin on the Pokémon concept of exploring a map and making collectable characters fight and evolve. Nintendo doesn't take them down because they aren't infringing on the Pokémon brand (or doesn't seem to notice the ones that do). 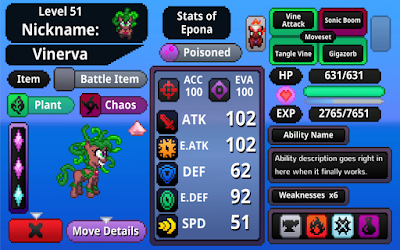 The characters and assets are at least a bit different, although a few of the mobile ones have sprites closer to Pokémon assets than Battle Gem Ponies ever was. For the most part, Nintendo leaves them be because they only issue takedowns to protect "Pokémon", not the monster collector genre they created. There was a court case a long time back that settled the debate of if a game could patent a gameplay style. Capcom v. Data East was an interesting case that put the argument of 'what elements of a game are copyrightable' to the test. Basically, if the game is built from scratch, avoids trademarks, and doesn't infringe protectable expression, it's allowed to compete in the market. Legal barriers for protectable expression like source code, specific characters, and iconography are in place to keep games from being virtually identical. A game just different enough to be legally safe, but feels like an unoriginal knock-off. 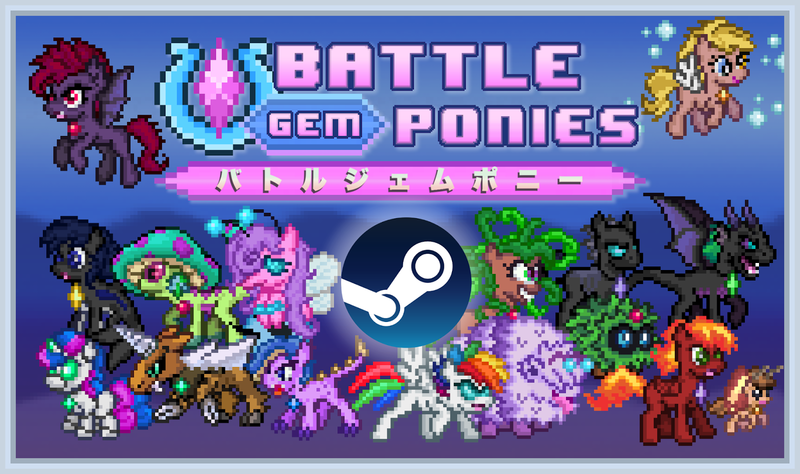 Battle Gem Ponies also looked like an unoriginal knock-off, so I had to change it. 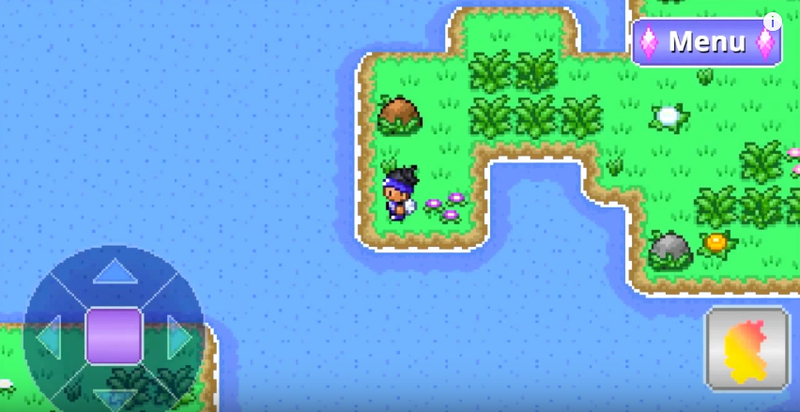 Things can even share similar public domain bases for their ideas, like the concept of walking through tall grass and ending up in a random encounter with enemies à la Dragon Quest. But beyond that, even if something's legally safe that doesn't make it good. If anything the game will face the problem of being in a masterpieces shadow, having to compete on the same critical grounds. That's when I look at BGP and think about why I'm bothering to make this. 3 years of my life down the drain to make a game that already exists? No. Playing Pokémon Sun reminded me that while many improvements have come along over 7 generations, there's still problems with the series that just won't be addressed anytime soon. Problems like boring grindwork to get a competitively viable team and battles that are meant to be epic boss fights simply being encounters you can tap through with minimal effort just by coming into the fight with an advantage the game beats you over the head with. Both problems combined with the thought of grinding my way through a series of mindless trainer battles are enough to make me look at my 3DS on my day off and think "Nah. Don't really feel like doing that." But that's why Nuzlockes are a popular thing, right? Lots of people feel that adding permadeath and limiting captures makes the game more challenging and interesting. Yet Pokemon won't be adding in-game support for that because they don't need to when players can manage that themselves. Fan games would love to be able to experiment with these ideas through mods and hacks, but Sega seems to be the only company reacting positively to fan games these days. A lot of projects somehow fly under the radar, but a lot of the ones that go viral tend to get the ban hammer. So if you're obsessed with an idea for a sequel or an improvement to a game that you're willing to implement yourself, but you can't legally build on top of the source material, the remaining option is to build something similar to it from scratch. 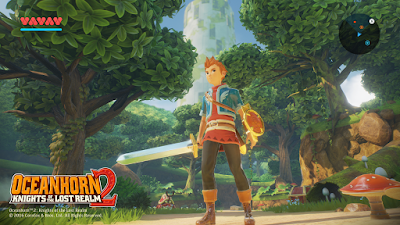 Getting back to the topic of copying other games though, I wanted to bring up Oceanhorn. A pretty famous Zelda clone and a pretty good example of something that's legally safe, but now has to lurk in the shadow of the series that inspired it. 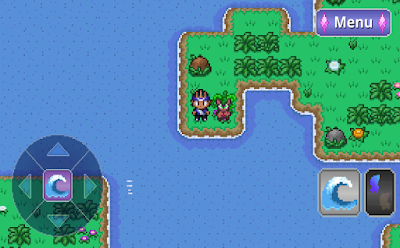 It emulates the Zelda gameplay. It copies the look & feel, but without actually copy/pasting assets. New source code built for entirely different platforms too. Oceanhorn is it's own critically acclaimed series now, topping mobile charts and raking in millions too. It's legally safe, and the game even feels solid and plays well. But now it has to be compared to Zelda games and that's a tough act to match. [Insert joke about better than Skyward Sword here.] Going by the reviews and general conversation around the game though, it seems to have all worked out just fine. 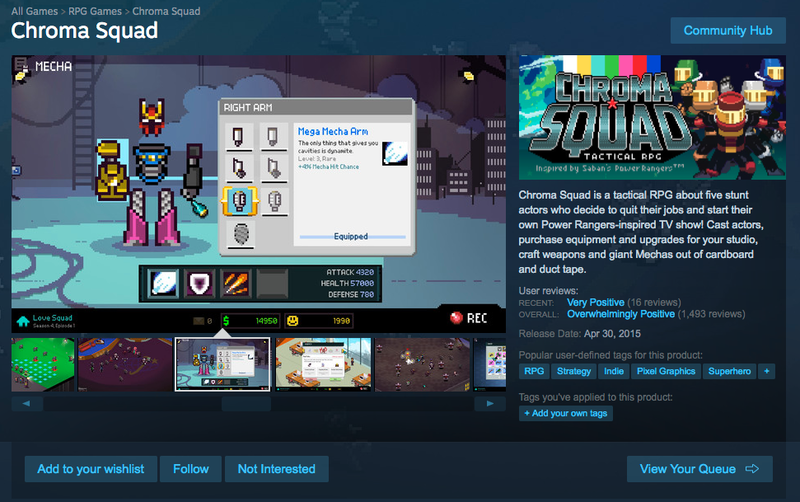 Now when it comes to owners of TV show IPs feeling like their properties are being ripped off, you might get cases like Saban v. Chroma Squad where that Kickstarted game's characters where a parody of the Power Rangers and Super Sentai series. Even pixelated, they look exactly like Power Rangers. It outright says it's a parody, but that's a legal grey area. One that a company like Saban would like to flex it's muscle on. 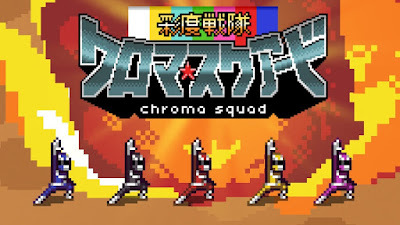 In the end they settled for a royalty share instead of going to court, and Chroma Squad now directly states on Steam that it was inspired by Power Rangers (but went ahead and redesigned the characters anyway). They say the paperwork and beuracracy involved with every little process is really annoying and slows development down, but things worked out well in the end. 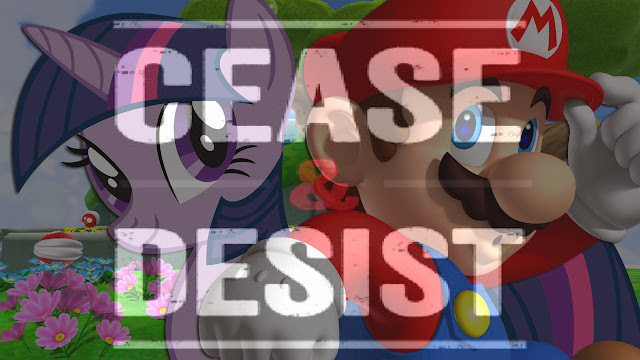 they shut down Fighting is Magic because pony violence is a no-go. Then there's the fact that Battle Gem Ponies are NOT My Little Ponies. They're scrappy pony monsters with gemstones for hearts. I feel that when most monster collecting games come out they're not made to build on top of the Pokémon idea and take it in different directions. Most of the mobile ones want to be confusingly similar and grab as much attention as possible to make their freemium systems work. 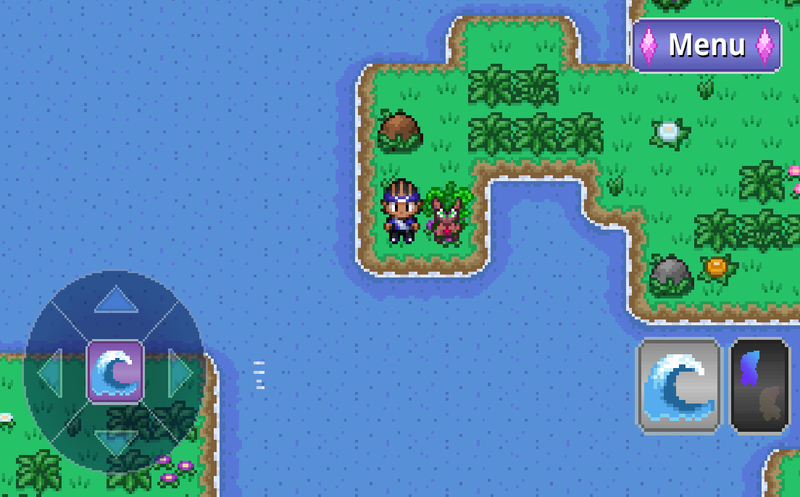 But then there's games like EvoCreo that just want to see genuine Pokémon gameplay on mobile phones. Or Collectems which wants a dark tone, procedurally generated levels, and an emphasis on dialogue options. 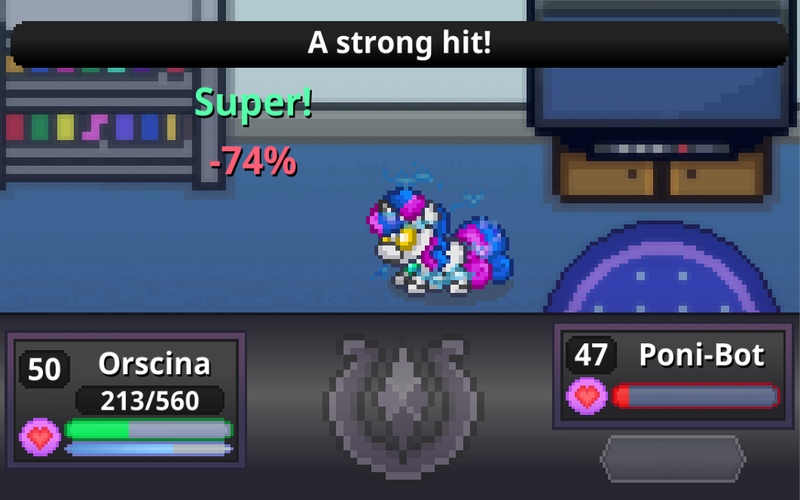 For Battle Gem Ponies, it's about making a Pokémon-style game with less predictable battles, colorful animated pixel art, Undertale-style flavor text to give everything more personality, limited moveset groups that enforce strategic planning, and cute/cool marshmallow pony characters with a gemstone motif. 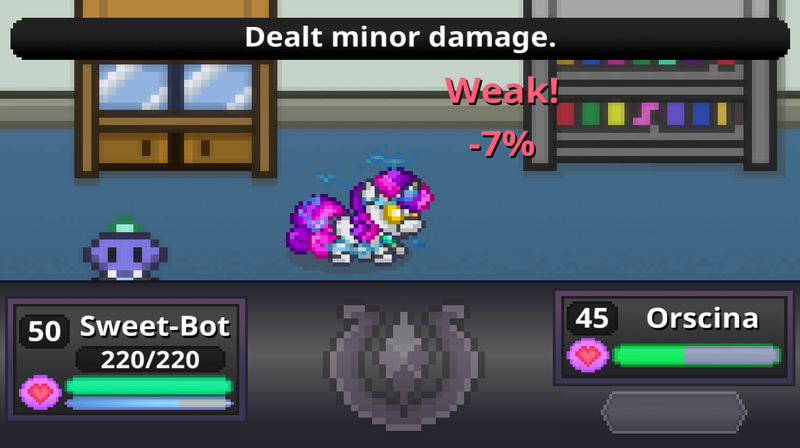 My goal is to make sure Battle Gem Ponies is not only legally safe, but creative enough in its own right to be recognized as a unique Intellectual Property. Nothing in this game will infringe on Nintendo's nor Hasbro's copyrights, so there is no need to worry about the game being shutdown by industry giants.